Two tintypes (approx. 2.5 x 2 inches each) mounted into cardboard frames (approx. 2.25 x 3.75 inches each). 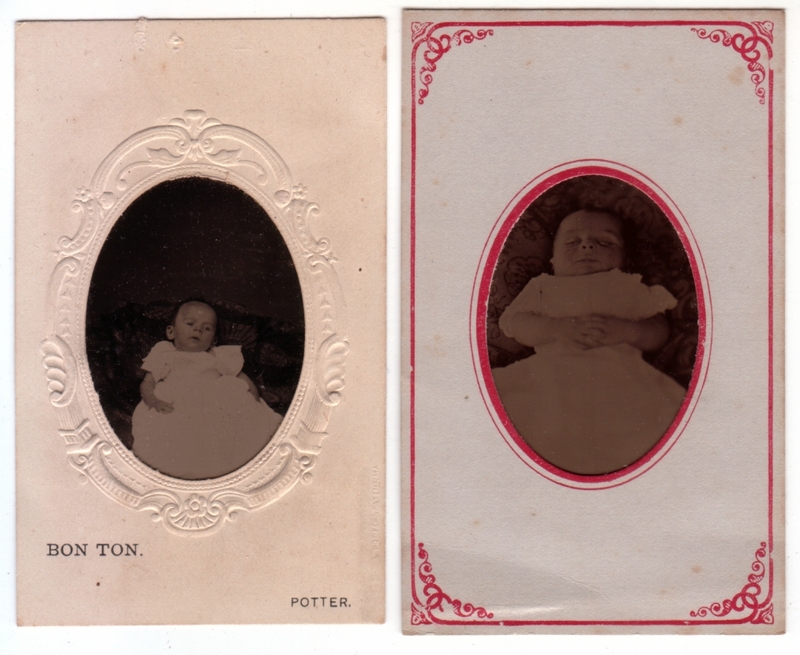 Photographer of the first one is Bon Ton of Potter (Wisconsin?). Otherwise both are undated and unidentified, though both are from an album from which I’ve posted photos previously. Happy Day of the Dead! I think it’s safe to assume that most of the people pictured in this blog are now dead, but here are a couple of photos of people who were dead when the photos were taken. These are called post mortem photos (also spelled post-mortem; also called memorial portraits, or memento mori). These were relatively common in the 1800s, and while the practice still exists (a coworker showed me photos that were taken at his father’s funeral just last year), it has fallen out of favor as our culture has grown more squeamish about photos of the dead. But back in the day, such photos were welcomed as final images of loved ones. Not that people in the 1800s felt less horror and dismay over death, just that they didn’t feel the corpse itself was something to be shunned in the way we do now. So they took photos of them. The deceased were dressed and groomed, and laid out like they were asleep, as above. Sometimes they were propped up in lifelike poses, even going so far as to have their eyes open (I’ll admit, the open-eyed ones look spooky to me). Sometimes they were lying in a coffin, but just as often they’d be seated in a chair. And they posed with the living, with surviving parents holding dead children, and remaining relatives posed around a corpse. Even the old practice of tinting the cheeks was applied to these photos. As far as I know, the above photos are the only two post mortem photos I have, though others are easily found online if you want to see more examples. I treasure them, partly because tintypes are one-of-a-kind, and also because these are likely the only photos ever taken of these children. (It was often the case that post mortem photos were the only photos ever taken of the subject, even with adults, back when getting your photo taken was a special occasion, which was part of the motivation behind taking them in the first place.) And if you consider that over the last 150 years the courthouse records may have burned, the family Bibles may have been lost, and the tombstones may have eroded, these two photos may be the only remaining evidence that these two children ever existed at all. So as we celebrate the departed today, we’ll spare a thought for them and whatever little lives they managed to have had all those generations ago. Do you remember the New Yorker article a few years ago, written by the father of a stillborn baby? It struck me that the nurse in their hospital asked them if they wanted a photo of the baby. They said no, and the nurse warned them that most people really wish later that they had a picture to look at. I can’t remember if the father then agreed to it, but I do think there was something later in the article about how he came to understand why parents would desperately want this kind of picture. Wow, no, that sounds fascinating. I don’t remember reading it, which means it’s probably in my pile of unread magazines. I’ll be sure to look for it. 2 Nov 2011 at 12:38 pm M.O. Matt, thank you for reminding me that it is the Day of the Dead. Fittingly, when I took a walk this morning, I thought about my aunt, who passed away a decade ago. As soon as I did, I saw a butterfly (symbolic of departed souls in many cultures). I am very moved by the photos. I’ve always heard of post-mortem photos, and I think I’ve seen a few in books, but I’ve never really looked at them closely. I would never have guessed that the one on the left was a post-mortem photo. Harriedcostumer, I do recall reading that article, and I cannot remember what the father decided to do. Thank you for reminding me of it. I’ll have to look for it. Thank you for the butterfly story, that’s beautiful. I’m pretty certain the one on the left is post-mortem. It’s eyes are slightly open, and it’s not in some coffin pose, so it’s easy to question it. It was right next to the other one in the album, which is what clued me in to it in the first place. Some of the ones I’ve seen online are startlingly life-like. And you’re right, they can be incredibly moving, particularly when they are posed with surviving relatives. And that was quite possibly the saddest post you have, Matt. They don’t look dead. I’m freaking out right now. If I can’t tell the difference between dead babies and live babies…I’m going to have nightmares. Because the photos are sweet. And so many babies died in the 1800s. And…and…and…thanks, wordpress, for telling me I should check at this specific archival post. Aww, Christine, I’m sorry, I wasn’t trying to be sad. A little melancholy and reflective perhaps, but not depressing. Not that the loss of a loved one isn’t an occasion for sorrow, but I’ve always felt there was something beautifully touching about the survivors’ efforts to capture this one last impression of the deceased, and something healthy about the acknowledgment that death is a part of life. Post-mortem images are a very popular collectible, strange as it may seem. And they were part of the photographic genre from the earliest dates – I have a post-mortem Daguerreotype in my collection. I still find them a bit chilling (can’t shake the 21st century feeling about it) so I stick to my CDVs of circus people and Native Americans. Somewhere in storage I have an image that was taken with an 8×10 view camera of the floral arrangements at a funeral. These things could get extremely ornate. If I find it, I’ll scan and post it. I find them fascinating, and I completely understand the appeal as a collector. I was lucky these ones happened to come in a larger album that I got cheap, since their appeal to collectors tends to put them out of my price range (as is true of so many photos considered “collectible”, which is why I’m glad I enjoy ordinary images, too). I have another one that I’ve lately been thinking might be post-mortem. Perhaps I’ll post it and let others weigh in with thoughts on it. And I have a couple other ones that don’t show dead bodies, but seem to be memorials in some way, including one of a family posing rather somberly with a painting of a little girl. It’s possible the painting is of one of the children present, but it looks more like they are honoring somebody deceased. Yes, I’d enjoy seeing yours, too. It’s always a treat to see what other people have. That’s one of the joys of the internet, the way it makes everybody else’s collections accessible. There is a resurgence of this custome particularly in the realm of infants and early mortality. The healing that comes with these photo sessions is said to very effective. Check out the organization Now I Lay Me Down to Sleep: https://www.nowilaymedowntosleep.org/. Art and healing medicine at its finest. Bless these folks. How interesting! I know that post-mortem photography didn’t die out completely, and is still practiced in various parts of the world, though attitudes toward it have certainly changed over time in the US. Thank you for your contribution.